If you’re living in a region where temperatures get low during the winter months, you’re going to need a device to keep a hole melted in the middle of the pond through the winter. When a pond gets a layer of ice, a heater (or deicer) is used to melt a small opening in the ice letting toxic gases out and oxygen to get into the pond. This is best done with an electrical pond heater. However, the heater can greatly raise your electricity bill. Pond heaters pull electricity from 100 watts (for ponds up to 400 gallons) to 1500 watts (for ponds up to 1000-1500 gallons). Alternatively, goldfish and koi can be taken indoors for the winter. They can be placed in a tank or a small children’s pool. But be careful with plastic pools, as plastic residue can be toxic to fish. A simple remedy for this would be to fill up the pool with clean water and add 1 tablespoon of salt for about gallon of water. Give time to settle for a few days, then rinse off and add fresh water. If the dissimilarity in pH levels is too big, the water can hurt the fish. Pond heaters come in two designs, a submersible pond heater, and a floating pond heater. A floating heater will use electricity, oil, or natural gas for its power source. There are even some models with solar panels to power the heater. A floating heater uses hardly any energy and is essentially created not to heat the water, but instead to prevent ice from developing in the first place. A floating pond heater can work both as a pond deicer and/or heater if your garden pond already has ice on the top. You can put the floating pond heater on top of the ice and it can thaw a hole through the ice, gradually melting all or most of the ice on the pond’s surface, depending on the size of the pond. To get the most out of the koi pond heater make sure that you secure your system as much as possible from heat loss. The less heat you lose, the lower the electricity bill is and the more efficient your heating device is. Quick note: Never use physical force to bust an opening in the ice. Fish are very delicate to shocks this can create and striking the ice can frighten or greatly injure fish. There are many Arowana Variety in the world. Popular Varietys are silver , Black , Malayan , red and Asian Arowana. But most popular and high costly arowana fish Variety is Golden arowana Fish. Scleropages Family Golden arowanas scientific name is Scleropages formosus. 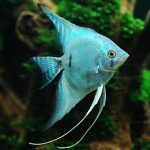 this Beautiful fish Swimming style is so calm and quit therefore watching their swimming is good for your mind. The Golden Arowana , threatened with extinction in the wild is protected world wide by the CITES convention. All wild caught Fish species that comes under the CITES convention are not allows to be exported or to be imported. The Government of the Golden Arowana native lands have given special approval for the captive breeding of these heavily sort after fish. These captive breed fish are allows to be exported or imported under the special certificate. In order to distinguished captive breed ones , all captive breed specimens are marked with a special micro chip with a serial number which is inserted in to the fish when young. The fish will carry this number which is detectable from a special scanning device , till the end of its Life. This is the most expensive and most colorful Arowana variety in the world.Mostly they originated from Malaysia and other Asian countries. That one is the most expensive color form for the Asian Arowana group. There are many varieties in the Malaysian Golden Arowana, they divide two group using their metallic based color and level of goldenness. Fully golden or all round golden Name as a cross back , half golden name as a high back and golden value between the cross back and the high back is name as super high back among the arowana breeders. South Asia region that fish Grow around 75 cm length. Also they require large tank to live. 250 gallon to upper fish tank better for their home. Never choose small fish as a their tank mate because of their carnivorous fish species. They also eat small fish , insects and every live element fit to their mouth. Take care before choose their tank mate. Oscar or other same nature large fish good for their thank mate.Subscribe our YouTube Channel and watch more fish videos. 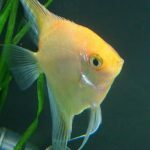 The freshwater angelfish are freshwater members of the cichlid family, and they come from South America. The angelfish is a well-liked tropical fish because of its special shape and their intriguing personalities. 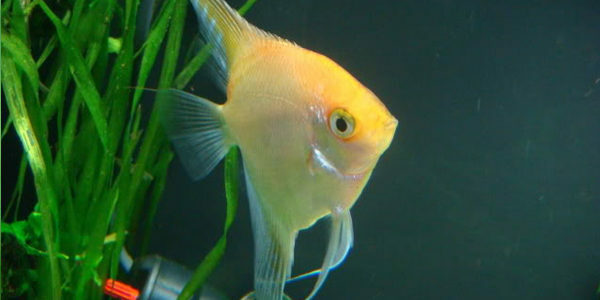 Freshwater angelfish are ruthless eaters and will go to the top of the tank when they see you come closer. Given that of their intense feeding practices, be sure that your less hostile fish are getting their chunk around feeding time. This species may reach a total length up to 6 inches and may expand up to 8 inches tall. Like almost all cichlids, they present a laterally squeezed body structure that means that they are relatively thin. These fish come in a wide range of colors and patterns varying from solid silver to shaded stripes or black-and-silver marble. 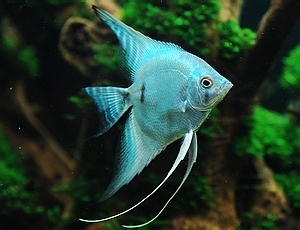 As a type, freshwater angelfish are usually pretty peaceful but they may not get along with other too small fish. These fish live ten years easily or even longer and they prefer to be placed in aquariums with many of their own kinds. The guppy, also typically identified as Rainbowfish due to the multiple rainbow-like colors they appear. They are also called the Million Fish. The Guppy is the most widespread and widely sold tropical fish. Most aquarium owners like having the guppy because it is one of the well liked fresh water aquarium species. It is live carrying, meaning that that the guppy hold and maintain its eggs inside of its body and at the time of birth, the guppy gives birth to free swimming and live young. 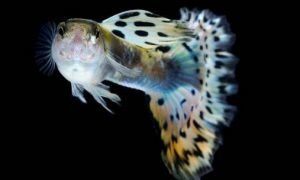 Guppy fish care is practically trouble-free and affordable, but they can get health problems just like any other fish. Within the correct conditions, Guppy Fish will breed around 3 months old, and live about 3 years. Guppies need a neighborhood of at least ten or more inhabitants, so a good size tank is necessary. Do not put them in an aquarium less than 5 gallons, and if possible not under a 10 gallon tank. I recommend a 20 gallon tank with plenty of “safe” friends. However, if you decide to have only one fish, a 5 gallon fish tank should be fine. Many fish and plants can endure a special level of temperature. 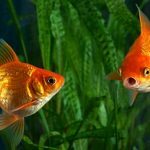 Persistence is also an extra factor that should be considered when breeding fish in tanks. Unexpected and major alterations in water temperature can cause health challenges in fish. For guppies, the perfect temperature sits between 50°F – 85 °F (10-30 °C). 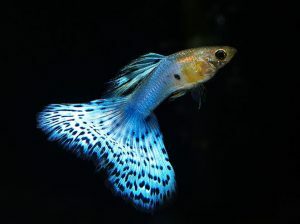 Guppies breed very often! They can out-breed a tank very fast! If you see a male putting on his fins and curling around the female, they are expressing their courtship. Once the female is fertilized, it will take about 28 to 30 days to give birth. Her belly grows quickly until she appears like a box, not a fish, yes that is true! She will go to the lower part of the tank to rest on plants and such, and lose her appetite and stop eating. As a basis for their diet program, you can give your guppies the classic fish flakes. Combined with the flakes consider adding other things such as live or freeze-dried foods. Watch out for the tropical flake food in the aisles which is made for tropical fish like guppies, these are no good. Go for either Omega One Super Color or Tetra Color Tropical Flakes. 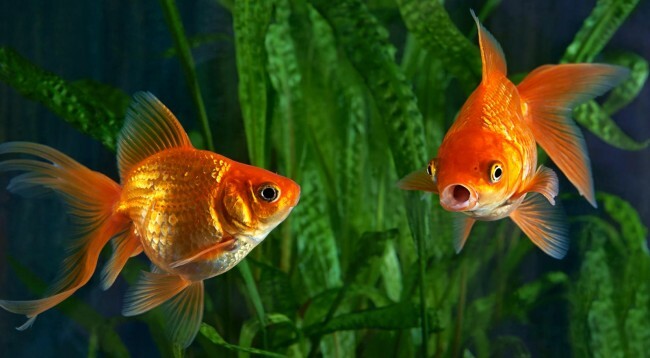 Providing the suitable amount of food is important since overfeeding can harm your fish. Guppies have stomachs that are just the size of their eyes! Overfeeding these magnificent fish can block their intestines and cause other health issues. Did you know, if you float your hand around a tank with guppies in it, they will pursue your hand, wishing food? The Arowana is a lengthy, smooth streamlined fish of magnificent beauty with a one of a kind character. They are large and usually aggressive with the capability of fast growing. It is believed that Arowanas bring in good luck and fortune. Their bodies are coated in large, heavy scales with a beautiful pattern of canals. Arowana are also described by two, darkly colored lines that stretch from its bottom lips. These lines are sometimes fragile, and can easily be harmed by bad handling. Because of their demanding design and utter size, the process of parenting this fish should only be pursued by a devoted and seasoned aquarist. They are also one of the most highly-priced kinds of aquarium fish, with some adult individuals costing tens of thousands of dollars. Keep them a suitably sized tank; the arowana is a surface-swimming fish, so size of the aquarium is rather important. Arowanas are enthusiastic jumpers, so make sure to have a tight-fitting tank hood. They are more vulnerable to nitrites than other fish, so supply proper filtration and execute 10 to 20% water changes when needed. Steady water quality and ranges are essential to the health of life in the tank. If you are suspicious of your water quality, ask an expert on how to test the water quality. The natural diet can vary from small fish, frogs, invertebrates and even some plant substance. Also mealworms, crickets, grasshoppers, insects, garden worms, fly, shrimps, beef heart, and so on. The foods your arowana will like are very individual to the fish, so test out plenty of different items and see how they react. Some food helps to encourage color in your fish. Any food that includes carotenoids will help to establish red and gold coloring in your fish. But it is always wise to keep a varied diet in your fish. You can also give live food on material high in carotenoids, such as feed carrots or shrimp to mealworms and then the mealworms to the Arowana. Supplying food habits have an effect on both the size and color of your Arowana. Even though they have an insatiable appetite, feeding them too much food can make the fish grow more quickly but can negatively affect both the color and health of the fish in the long run. Given that the size, color and health are very significant do not overfeed Arowana too often. Arowanas get sick too; however, they typically get well quickly if you raise their water temperature and add a little salt.